I was going to write about a few really cool things that my husband is going to make for Christmas gifts this year. 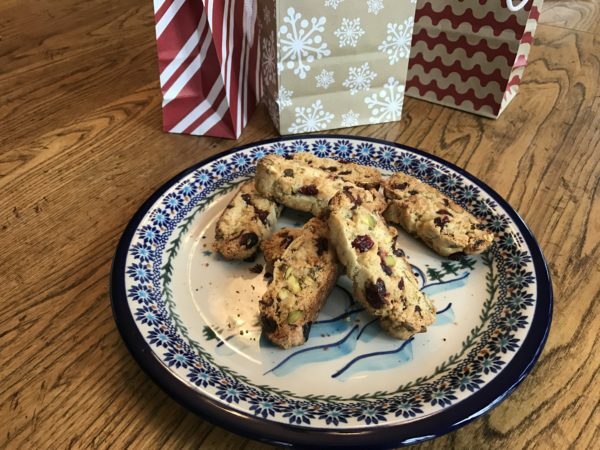 But in the interest of keeping future presents a secret (I’m looking at you, mom) and to placate my husband, who is very, very shy, I will share what I’m making for Christmas: Biscotti! These are my go-to gift cookies this year. It’s a simple recipe that can be somewhat tailored to what you have in the house. This is adapted from a Martha Stewart recipe. Preheat oven to 350 degrees. Mix flour, sugar, baking powder and salt at medium speed until combined. Add butter and mix until coarse crumbs form. With mixer on low, add eggs. Mix in apricots and pistachio -- if you don't have enough it really doesn't matter. One cup of each is a lot. Continue to mix until the dough forms into a ball. On a baking sheet lined with parchment, shape dough into two 12 inch logs. (I usually divide the dough in half, roll each half into a snake-like shape with my hands and then kind of mash it down to about 3 inches wide.) Bake until dry and set, about 25 minutes. Cool on a wire rack (To speed things up, you can put it outside if it’s cold or even in the fridge or freezer if you don’t worry about heating everything else up.) Transfer to a cutting board. With a serrated knife, cut logs into 1/4 inch slices. Sometimes it’s a little crumbly, but that’s ok, just eat any pieces that fall off). If you want to be fancy, you can cut them on the diagonal. Bake on parchment-lined sheets (I use the same parchment for both and guess what — nothing goes wrong if you don’t use parchment at all!) until golden or for 15 - 20 minutes. You should rotate the racks halfway through, but if you are not going to do that, set the time for more like 12-15 minutes. You can substitute any dried fruit and nut combination. We love dried cranberries and hazelnuts. And if you really want to dress it up, you can melt semi-sweet chocolate chips and either dip the cooked biscotti in them just halfway or drizzle chocolate on them. This batter is easily doubled or duplicated with varying fruit and nut combinations so you have a whole bunch, and a variety, for gift giving.